Available in 6 sizes from 0.5 to 2.0hp, Reltech's PREMIUM PR Series pumps are for decerning buyers that don't want to compromise. Offering high performance and low noise levels, PR Series pumps have been over designed for unbeatable reliability. Available in 4 sizes from 0.5 to 1.25hp, Reltech's SUNSOL SS Series pumps are for the budget savy buyer. The SS Series incorporate the same wet end technology as the PR Series, however, utilise a more cost effective electric motor. They are therefore inherently quiet and ideal for everyday medium head applications, commonly found in small to medium sized pools. 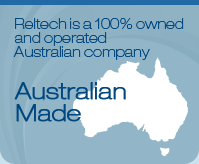 Available in 6 sizes from 0.5 to 2.0hp, Reltech's AQUA BOOSTER AB Series pumps are a non self priming version (i.e. without lint pot basket) of the PREMIUM PR Series pump. Incorporating uncompromising high performance and low noise levels, the AB Series have also been over designed for unbeatable reliability.